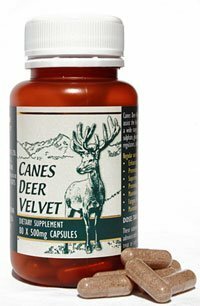 Since using the Canes Deer Velvet capsules I have noticed an overall improvement in health. At last something that works! I have relief from long term back and neck pain I have suffered as the result of an accident, I sleep better, and I cope with stress easier. I have noticed an improvement in my sports performance, increased power during gym workouts, even running seems easier! The capsules are also giving me faster recovery times from exercise and injury. When not using them these things noticeably deteriorate. This product has provided me with a significant improvement in life style and general well being. After taking Canes Deer Velvet Capsules for 3 months, I found they brought a new dimension to my endurance, vitality and physical fitness. I am a veteran athlete and have completed 9 marathons. I am currently training for a half marathon and I have found a remarkable difference in comparison to my previous training. Since taking Canes Deer Velvet I have noticed an improvement in energy levels and definitely don’t feel tired. Currently I am working long hours and continuing to train, and I don’t feel I could have done this without the aid of Canes Deer Velvet. I am in a wheelchair and have been racing on the US Goodwill Racing Team for 6 years now and this is the first time I have been able to recover from intensive training so quickly. I’ve noticed that my immune system does not allow me to be dragged down by the cold weather and intensive training. I sleep better and get up earlier feeling like I‘ve had several more hours of sleep. I can’t explain what’s happening but it feel’s good! I compete for New Zealand in the sport of snowboarding and have been using Canes Deer Velvet for 6 months now while recovering from a broken leg, (taking 3-6 capsules daily). I cannot speak highly enough of your product to my friends as I have benefited from its medicinal properties during my rehabilitation. It’s been instrumental in my recovery and an early return to a full training schedule. I work long hours in the position of Chief Examiner for the NZ Snowboard Instructors Division and use Canes Deer Velvet to help me stay healthy, focused and revitalised. I travel a lot within New Zealand and the United States and like to travel relatively light. Deer Velvet has so many benefits I don’t need to take a lot of other supplements with me to keep my energy levels up. I can honestly recommend Canes Deer Velvet to anyone who likes to lead a busy and active lifestyle. I have trialled Canes Deer Velvet for four months on it’s own. Taking 6 capsules per day I got a 10% increase in strength over the first two weeks and my recovery between sets was very quick. Over the next 12 weeks my strength went up each time I trained and my bodyweight went down. There were no side effects. For me this product is better than the Creatine powder I was taking, it gave me as good if not better results with no water retention, and with no mixing required so taking the Canes Deer Velvet was more convenient and better for me. Interestingly my food intake had also been cut back so as to lose weight. I am now trialing Canes Deer Velvet in the reverse while still controlling my food to maximise good body condition, at the same time increasing muscle and strength, and so far it is working for me. Several other people in our Health Centre have also been using Canes Deer Velvet and had similar results. Three of these people, Jim, Keri and Kate, have been selected to represent New Zealand at the World Body Building Championships. Canes Deer Velvet is one of the best products I have taken in my 25 years in the Fitness Industry. Since starting taking Canes Deer Velvet I have felt that my recovery from training has become much more efficient, enabling me to go into a session feeling less tired and fatigued, therefore increasing the effectiveness of the workout. I feel fresher physically which helps mentally. When racing I feel as though I can “dig deeper” and move to another level, whereas before I would have just one constant level of energy which is no good with such competitive racing.I have been taking 2x250mg capsules twice daily for the past five months and feel this has been of great benefit to me. I have raced back to back seasons and travelled alot which would normally take its toll and I would become ill, this has not happened and I am maintaining a level of health and fitness for a much longer period than I would normally expect.I thoroughly recommend the use of Canes Deer Velvet to any one intent on maintaining a healthy, busy lifestyle. Since taking Canes Deer Velvet I have received absolute relief from long term pain in my shoulder as a result of calcification and tendon problems. I now have no inflammation or pain in the area. After 15 months of suffering, I had been advised by my specialist to give up Triathalons and any other type of sport that involved shoulder rotation. For me, this was not an option, as I compete at the very highest level. One year later I can now honestly say that taking Canes Deer Velvet has allowed me to continue my sport and enjoy life to the max. I would thoroughly recommend Canes Deer Velvet. Help yourself to quick recovery today. Check out this month’s special offers.